Justin Bieber and Sofia Richie were pretty hot and heavy for a solid two months or so, but like most young loves, it fizzled out quickly. Since their trip to Mexico for Sofia’s birthday the couple hadn’t been spotted out much and word on the street is that Bieber wanted to be single. If you can remember, Bieber deactivated his Instagram because Beliebers hated the fact he was with Sofia and were pretty brutal on her comments. He yelled at them and then Selena Gomez yelled at him, it was a big old mess. 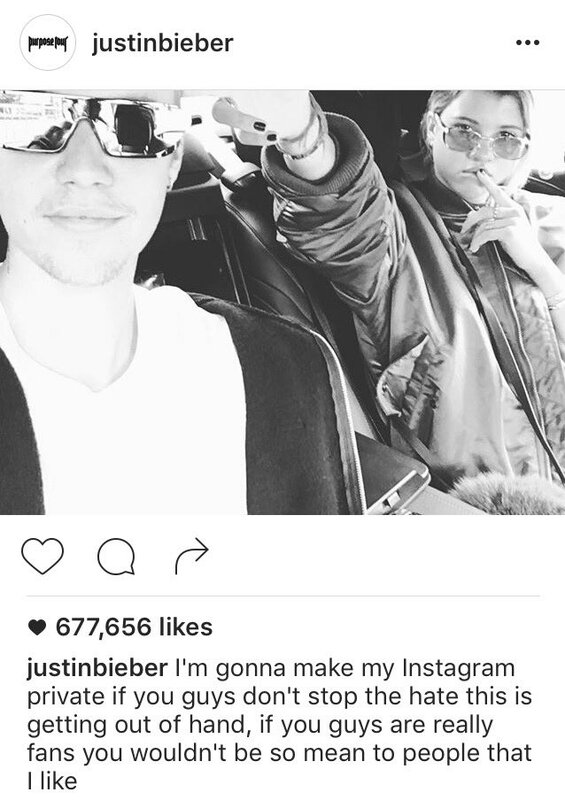 So does this mean Bieber will be back on Instagram? Or will be continue to be lowkey? I will give him two weeks before he is on Instagram. Justin Bieber is currently, most likely, not yet confirmed, dating Lionel Richie’s daughter Sofia Richie, and Beliebers aren’t happy about it. Obviously Beliebers are deranged to begin with but Justin has had it with the negative comments that have been posted on his Instagram account after seemingly becoming Instagram official with the 17 year old model. Bieber is straight up fed up with his fans and told them that he would make his account private if they continued to be so hateful. I understand that, I can see where he is coming from. For once, I actually agree with Bieber, can you believe that? Maybe just tell them to not comment mean things, rather than trying to have some kind of abusive power over your fans. That may work better. Instead of the Beliebers being understanding they started a hashtag on Twitter, because that’s what you do now. They started the #RIPBeliebers trend because Justin called them fans instead of Beliebers for the first time. How dare he?! Also, I am about 90% sure he will put his account on private then post a long tweet about how he isn’t a zoo animal again. What do you think?